On the heels of Breeders’ Cup 2011 I have been doing a great deal of thinking about betting strategy. It seems as if I should have won more money than I did. So, I went back and looked at the BC2011 selections that I posted in my blogs. Not only did I have five winners right on top, but I had four horses that didn’t win but hit the place spot. That is nine out of the fifteen races that could have been profitable. Should those races have been profitable? The answer came when I hypothetically applied a two dollar win and place wager to each of my picks. In the chart you can see that eight of those nine races would have ended up in the black. For the two days of Breeders’ Cup wagering that would have produced earnings of $36.80 for an ROI of 61%. You can’t get that kind of rate in a savings account. Of course I did not make a win/place wager on all of my selections. I only made vertical wagers on a few of the races. My second biggest win came on a win/place bet on Amazombie in the the Sprint. Mutuel payouts of $17.80/$7.40 will do that for a bettor. I did not profit from Caleb’s Posse who paid $15.60 and $7.00 to win and place. Nor did Turallure’s $10.00 place price put money in my pocket. Royal Delta went off at 2-1 and I got nothing from that pick. How could I have missed those opportunities? It was the lure of the big payout in the horizontal mult-race wagers. 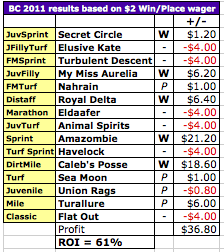 Yes, I did collect the most from Friday’s early 50¢ Pick 4 that was anchored by Secret Circle, but there were many other Pick 3, 4, and 5 tickets that drained away the profits. It is just so tempting when you see the payouts. On Friday, November 11, at Monmouth Park the 50¢ Pick 5 paid an amazingly large $277 after five favorites won in five very small fields: $7.60 (6 horses), $3.60 (5), $4.80 (5), $4.40 (4), and $5.20 (8). These horizontal wagers often out pay the parlay figures. My good handicapping in Breeders’ Cup 2011 was not duly rewarded. I need to start relying more on win/place betting and to be far more selective about my exotic wagers.